Inventive, opinionated and commercially minded, Mary Quant was the most iconic fashion designer of the 1960s. A design and retail pioneer, she popularised super-high hemlines and other irreverent looks that were critical to the development of the 'Swinging Sixties' scene. 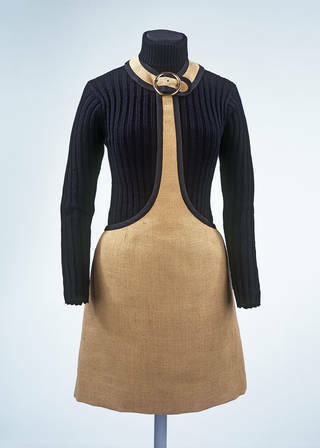 Our fashion collections include examples of her famous designs from across the 1960s and 1970s. Mary Quant was born and brought up in Blackheath, London, the daughter of two Welsh schoolteachers. Following her parents' refusal to let her attend a fashion course, Quant studied illustration at Goldsmiths, where she met her future husband, the aristocrat Alexander Plunket Greene. She graduated in 1953 with a diploma in art education, and began an apprenticeship at a high-end milliner, Erik of Brook Street. In 1955, Plunket Greene purchased Markham House on the King's Road in Chelsea, London, an area frequented by the 'Chelsea Set' – a group of young artists, film directors and socialites interested in exploring new ways of living – and dressing. Quant, Plunket Greene and a friend, lawyer-turned-photographer Archie McNair, opened a restaurant (Alexander's) in the basement of the new building, and a boutique called Bazaar on the ground floor. The different strengths of each partner contributed to their long term success; while working together on all aspects – Quant concentrated on design, Plunket Greene had the entrepreneurial and marketing skills, and McNair brought legal and business sense to the brand. Quant initially stocked the shop with outfits she could source on the wholesale market, exploiting the opportunity to offer a new take on women's style. But she soon became frustrated with the clothes available. Encouraged by the success of what Quant described as a pair of 'mad' lounge pyjamas that she had designed for Bazaar's opening (the design featured in Harper's Bazaar magazine and was later purchased by an American manufacturer), she decided to start stocking the boutique with her own designs. Quant was a self-taught designer, attending evening classes on cutting and adjusting mass-market printed patterns to achieve the looks she was after. 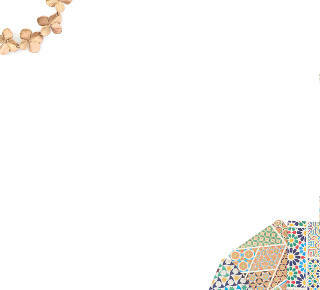 Once technically proficient, she initiated a hand-to-mouth production cycle: the day's sales at Bazaar paid for the cloth that was then made up overnight into new stock for the following day. Although exhausting, this cottage-industry approach meant that the rails at Bazaar were continually refreshed with short runs of new designs, satisfying the customers' hunger for fresh, unique looks at competitive prices. I remember the typeface and the big plate-glass window and the fact there were just two dresses, and you saw straight into the shop. There might have been a screen or something, but it wasn't like a normal shop-window display. It wasn't 18 dresses with lipstick and pretend wigs on; it was a different look altogether. It was terrific. From the late 1950s to the early 1960s, Bazaar was one of very few shops in London that offered an alternative to the 'mature' styles produced by other high-fashion designers. It also offered a radically different shopping experience than the couturiers, department stores and chain stores that made up the mainstream fashion market. At Bazaar, loud music, free drinks, witty window displays and extended opening hours created a 'scene' that often kept going late into the evening. Young women travelled to Bazaar to enjoy shopping for 'something different' in a much less formal environment. Quant's developing aesthetic was influenced by the dancers, musicians and Beatnik street chic of the Chelsea Set, and the Mods (short for 'Modernists'), a powerful subculture that helped to define London's youth culture in late-1950s Britain, with their love of Italian sportswear, sharp tailoring and clean outlines. Quant's first collections were strikingly modern in their simplicity, and very wearable. Unlike the more structured clothes still popular with couturiers, Quant wanted "relaxed clothes suited to the actions of normal life". Pairing short tunic dresses with tights in bright, stand-out colours – scarlet, ginger, prune and grape – she created a bold, high-fashion version of the practical outfits she'd worn as a child at school and at dance classes. An interest in the unexpected was another signature for Quant. She played with scale and proportion, and referenced clothing of the previous century, subverting familiar elements from garments such as Norfolk jackets, tab-collared shirts and Liberty bodices. 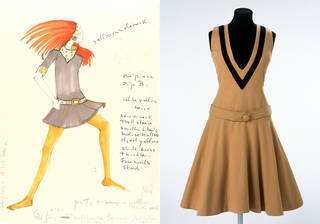 One of her early designs from 1958 – a three-piece outfit in grey flannel – combines a hat, knickerbockers and a tunic-style shift: a striking ensemble that revisions Victorian undergarments as a quirky form of daywear. Other examples of Quant's irreverent approach include her line of men's cardigans long enough to wear as dresses, and white plastic collars used to brighten up sweaters and dresses. Such designs easily allowed young consumers to buy into 'being modern'. 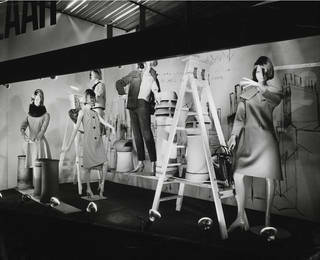 By 1957 demand for Quant's clothes had led to the opening of a second Bazaar store on the King's Road, in a space designed by Terence Conran. Quant is often credited with inventing the decade's most iconic look: the mini-skirt. There is no conclusive evidence to say who first took hemlines a daringly long way north of the knee (French couturier André Courrèges is another possibility). Regardless, extremely short skirts and shift dresses became Quant's trademark, and were popularised by the era's most high-profile model, Twiggy, whose willowy figure helped turn super-short hemlines into an international trend. 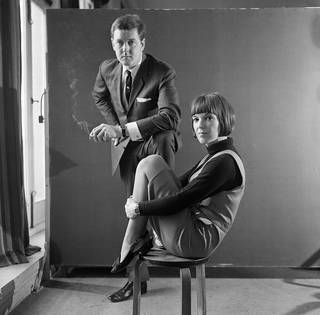 Mini-skirts and dresses were perfectly paired with Quant's tights and underwear range, one of the first lines produced using the Mary Quant name under license. Quant also created the 'skinny rib' sweater (apparently inspired by trying on an eight-year-old's sweater for fun) and, in 1966 invented hot pants. Capitalising on the 1960s' love affair with new materials, she was the first designer to use PVC, creating 'wet look' clothes, and different styles of weatherproof boots in her footwear range, Quant Afoot. As London's boutique scene was still blossoming, Quant was cementing her position as a commercial and cultural powerhouse. In 1962, she signed a lucrative design contract with American department-store chain JC Penney. In 1963 the company Mary Quant Limited expanded into the UK mass market with a new, cheaper diffusion line, Ginger Group. The same year, Quant was given The Sunday Times' International Award for "jolting England out a conventional attitude towards clothes". In 1966, she was awarded an OBE and published her autobiography, 'Quant by Quant'. The following year, she opened her third shop, in London's New Bond Street. By the end of the decade Quant was the UK's most high-profile designer and had achieved unprecedented reach in the market: it was estimated that up to seven million women had at least one of her products in their wardrobe, while thousands more sported the super-modern shades of her 'Daisy'-badged cosmetics range. For the first half of the 1970s, Quant remained at the forefront of fashion – her work was celebrated in a retrospective exhibition Mary Quant's London, at the London Museum (Kensington Palace), from November 1973 to June 1974. From the late 70s onwards, the business produced high quality womenswear, alongside coordinated interior designs for British manufacturing company ICI, including bedlinen, carpets, paint and wallpaper, diffusion ranges such as swimwear, hosiery, jewellery, the Daisy fashion doll, and popular make up and skincare products. Quant introduced skin care for men, and published books promoting her ideas about cosmetics. In 1990 she was awarded the prestigious Hall of Fame Award by the British Fashion Council, recognising her outstanding contribution to British fashion. She published her second autobiography in 2012, and became a Dame in the 2015 New Year's Honours list. In this film, V&A Conservator Nigel Bamforth shares his memories of working as a Production Manager for Mary Quant in the 1960s and 1970s.